Replacing the current showerhead with a hand shower shower head in the guest bathroom was always in the plan. I like how the hand shower in our Delta Faucet Company In2ition showerhead makes it easy to clean the Master Bathroom the soap out of Lacey’s fur. Being kind of a geek about showerhead and faucets, I wanted to know what the difference is between the Delta In2ition showerhead I have and like and the new Delta In2ition Showerhead with H2Okinetic Technology provided by Delta Faucet Company to facilitate this test and tutorial. Keep reading for a chance to win a Delta In2Ition Shower with H20kinetic Technology Showerhead sponsored by Delta Faucet Company! Each type of Delta In2ition showerhead is supposed to give you a different shower experience while saving enough water to earn the Watersense label - using less than 2.0 gallons of water per minute (gpm.) Although truthfully after using both of these showerheads, you would never guess less water is coming out of either one. It feels like I'm taking a shower with more water not less! What Benefits of H2Okinetic Technology and Why Should I Care? The water coming out of a standard shower sprays in a straight stream. H2Okinetic Technology directs the water coming out of the showerhead in an oscillating stream to create a fan of water with larger droplets. You can see the different water pattern in the photo I took during my visit to Delta Faucet Company headquarters. If I took this photo from the side, you would see the wave water droplet pattern the H20kinetic faucet makes more clearly. The same amount of water is flowing from each Watersense rated showerhead (2.0 gpm.) The only difference is in the size, speed, and movement of the water droplets coming out of the showerhead on the left has H2Okentic technology. The water oscillates as it leaves the spray hole in a wave pattern which creates the feeling of a high pressure shower experience - for real. 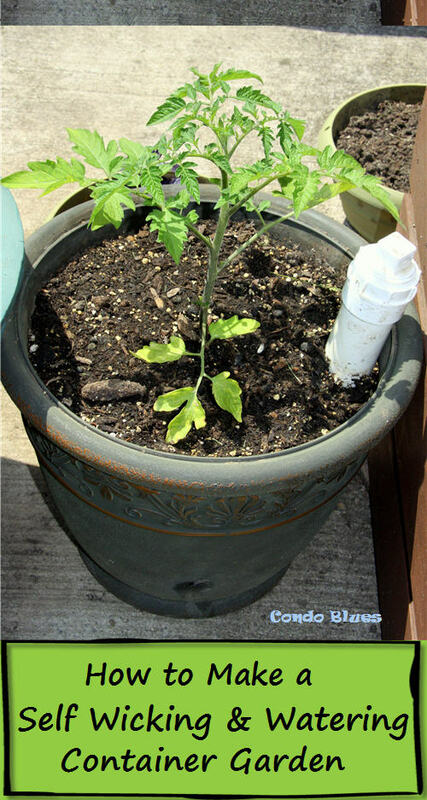 The H2Okinetic chip is self-cleaning and does not allow lime to build up over time. You heard that right, it is self cleaning showerhead! Just don’t ask me to pick one Delta In2ition showerhead over the other because it depends upon what type of shower experience you are going for both are fantastic! 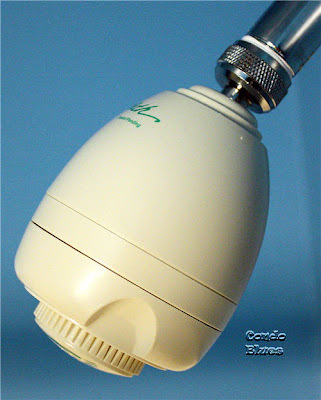 If you can screw in a light bulb, you can install this showerhead. That. Easy. 1. Unscrew the old showerhead from the shower arm pipe with your bare hand. You may need to use a wrench if you need a little more oomph! to remove the old showerhead. 2. 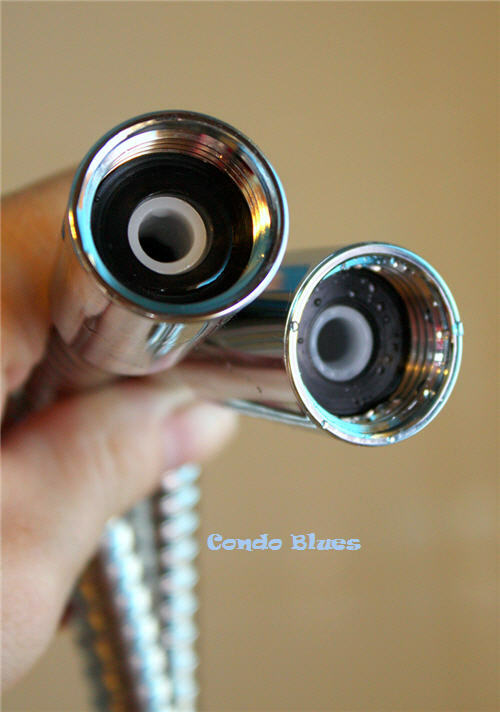 Double check that the rubber washers (also called a shower gasket) are in the connectors on each end of the shower hose and in the showerhead itself. If not, return the rubber gaskets into their proper place. The shower gaskets are already in their proper place when I opened the shower head box but it never hurts to check that they didn’t shift in the box during shipping and handling. 3. 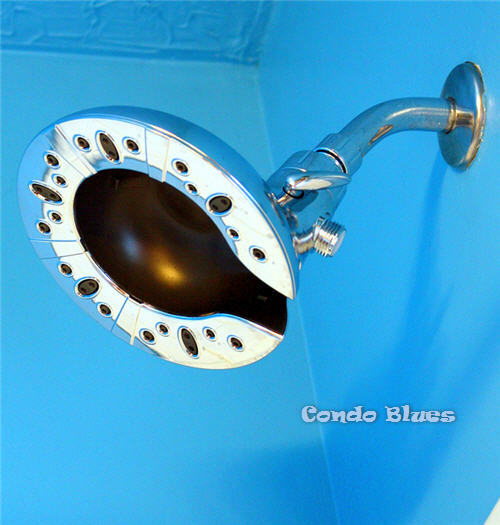 Screw the showerhead onto the shower arm with your hands. I installed and tightened the Delta In2ition showerhead with one hand! 4. 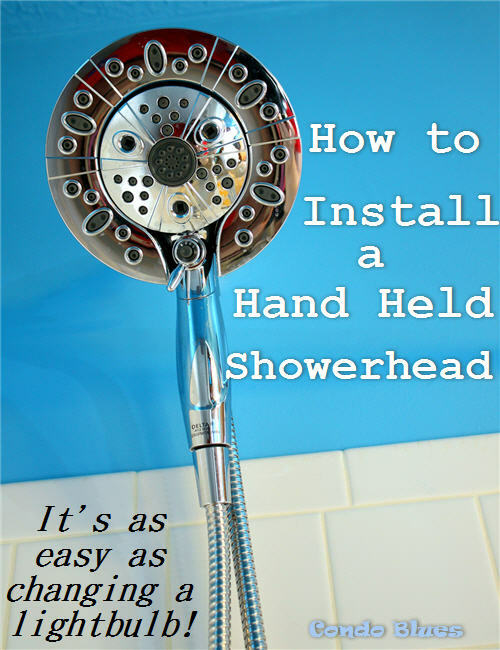 Hand screw and tighten one end of the shower hose to the showerhead and the other end of the house to the hand shower. Does the shape of the showerhead remind you of a horseshoe crab is is that just me? 6. Adjust the spray modes by pressing the button on the hand shower to move the lever into position. 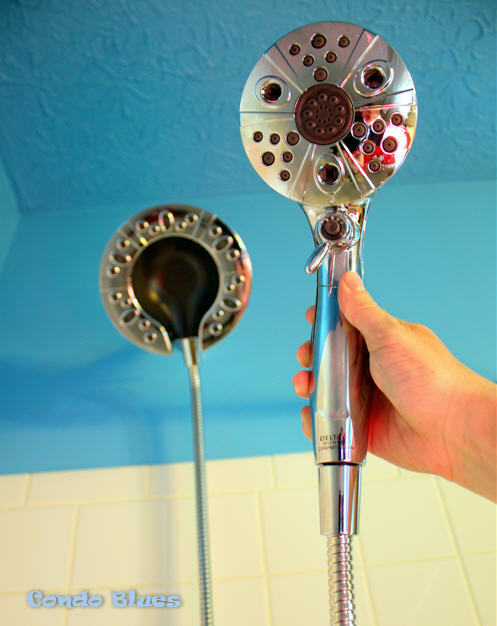 Turning the side knob changes the water flow from showerhead only, showerhead and hand shower, and hand shower only. 7. Step into the shower and clean up your act! Ok, I know you’re excited about this giveaway, so without further ado, here we go! 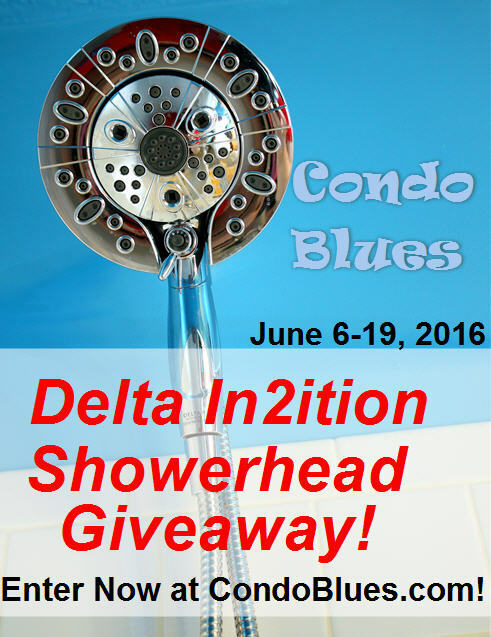 Prize: One lucky Condo Blues reader will WIN one Delta In2Ition Shower with H20kinetic Technology Showerhead in this giveaway! Open to US residents 18+. Winner will be notified by email and has 48 hours to respond or a new winner will be chosen. Void where prohibited. Condo Blues is not responsible for the delivery of this prize from Delta Faucet Company. 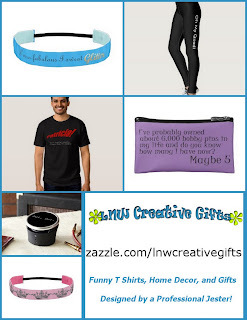 Giveaway is in no way associated with Facebook, Twitter or any other entity unless specified. 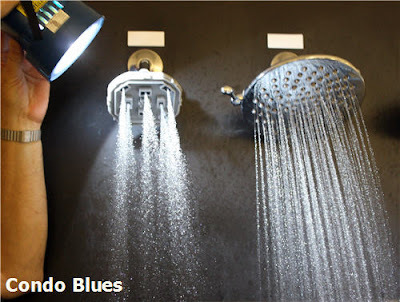 The Condo Blues Delta In2Ition Shower with H20kinetic Technology Showerhead Giveaway ends June 19, 2016 at 11:59 PM EST.